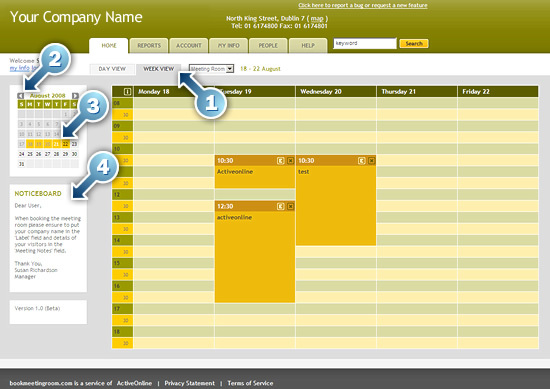 With BookMeetingRoom.com, it’s easy to keep track of meeting room bookings for your organisation all in one place. You can view availability and make booking reservations effortlessly, share reservations across your organisation and track usage. View by day or week. These tabs let you view meeting room availability and bookings by day or week. These arrows let you move forward and backward through the calendar a month at a time. You can specify which day or week to display in the main screen area by clicking on the calendar. You don't need to be logged in to check meeting room availability, however you must log in to make a booking. 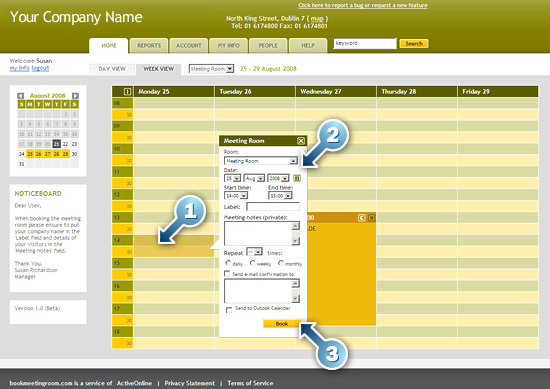 Once logged in simply select a date from the calendar on the left and then select (click on) any available slot in any room. Select time slot for meeting To make a booking simply click on a time-slot. A short booking form appears to allow booking. Fill in details Enter meeting title/label and some details. Make any adjustments, notify others and set frequency. Click book to reserve the time slot. Your Booking appears instantly. Your bookings are indicated by warmer colours. Other peoples booking by colder colours. Administrators can generate reports to analyse activity, to produce itimised bills, to allocate departmental costs etc. A set of prepared report options are available such as Usage by Booking User, By Department, By Label, By Room, By Keyword and there is a report to track meeting supplies requested. (Keyword report can be used to produce customised reports and works off data entered into the description field. i.e. Department Code. Reports can be exported in .csv format for use in spreadsheets if required. Generate report you were looking for!